Almerimar is a tiny oasis amid a large farming area, the immediate area around the town has an unusual feature as the farming is done under what seems to be miles of plastic sheeting! Don't let this initial shock put you off this little gem of a resort, it has a large marina and yachting club, there are many restaurants, bars, shops, and surprisingly good night life for a small resort. Fishing is popular with the locals due to the large quantities of tuna in the local waters. The coastal resort of Almerimar is located on the Costa de Almeria, 35 kilometres west of Almeria city (approximately 45 minutes from Almeria airport) and 195 kilometres east of Malaga. It boasts 12 kilometres of sandy beaches. Holidays to Almerimar are popular with both the British and Spanish holidaymakers (especially in August) it offers bars, hotels, shopping and night-life. The town is centered on the marina and yacht club and is also known for its golf course. The beach in Almerimar is quiet, with golden pebbly sand, calm and clean water which is often warmer than the air and is very well maintained. Sailing, windsurfing, snorkeling, and scuba diving are all available here all year round. 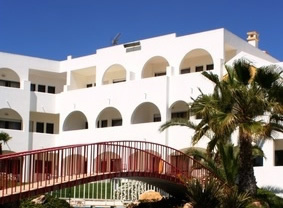 The modern 4 Star Almerimar Resort Hotel is right by the sea and is only approximately 300 metres from the marina. Almerimar is suitable for families and couples; however it is a more relaxing resort so may not be suitable for everyone. Golfers will enjoy the local and other nearby courses. In winter the ski resorts of the Sierra Nevada are approximately 2 to 3 hours away. Outside the popular month of August the resort reverts to its normal quiet state except at weekends when the music bars are lively until the early hours. Almerimar has a supermarket and numerous souvenir shops. The nearby resort of Roquetas de Mar is home to the Gran Plaza shopping complex and the City of Almeria can provide a wealth of outlets and boutiques for even the most dedicated shopper..
Almerimar has a wide range of restaurants which offer numerous cuisines, to suit everyone's taste. Alongside traditional Spanish Tapas bars there are Irish bars and music bars that provide entertainment until the small hours. In the summer months, the beach provides several 'Chiringuitos' (traditional beach bars) that open during the day each with its own unique atmosphere. The resort is quiet most of the year (except August) since the last of the '70's' style hotels were demolished a few years ago and replaced with private apartments. Things to do - There are numerous places to visit whilst in Almerimar, including; Troglodyte Villages, Mini Hollywood, Texas Hollywood, Water Park, Cabo De Gata Natural Park and the Astronomical Centre. The City of Almeria and the nearby resort of Roquetas de Mar are both worth a visit. Car hire is recommended. Travel Empire's favourite spots in Almerimar; The D Bar (Ginger John - El Hombre) & The Stumble Inn a cracking English bar by the marina, Havana bar and Nautico restaurant.